Progress at Second Avenue Subway's 72nd St. cavern as of January 21, 2014. UPPER EAST SIDE — The MTA is straining to complete testing of the Second Avenue Subway before its December deadline — with only about five months left to complete tests out of the 10 months the agency had originally allotted for the task, according to officials. The agency still has another 1,104 tests to complete by the end of October to be on target for the deadline, including tests on its elevators and various other systems, and crews are rushing to catch up, according to the MTA's independent engineering consultant, Kent Haggas. "The time available for testing of station equipment and rail systems requires a very aggressive and unprecedented performance of the combined MTA Capital Construction and NYC Transit test teams," Haggas said during a presentation at a board meeting on Monday. Other projects that are facing delays include installing police radios and fire alarms systems in each station, according to Haggas. If the subway line doesn't get completed by December 2016, the system won't be able to open to the public until 2017 and it would "have a financial impact on construction and support costs as well as the operating budget and prolong crowded conditions on the Lexington Avenue line," according to the MTACC officials. Michael Horodniceanu, the MTA Capital Construction president, said he was confident crews will get the work done by the deadline despite how it might look. “While it is a very tough a task to get it all done by December, we do expect that to be the case," he said. So far the majority of the subway's equipment has been installed on schedule — 80 percent of the May milestones will be met within a 30 day grace period, Haggas said. 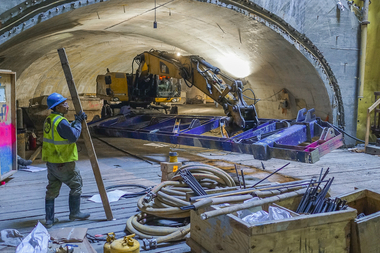 Construction of the $4.5 billion Second Avenue Subway project began in 2007 with the goal of connecting the Q line to the Lexington/63rd Street station, and provide service from East 63rd to East 96th streets along Second Avenue.